The Surahs from here onwards are mainly aimed at consoling and encouraging the Prophet salAllahu ‘alayhi wa sallam. Before his call he never had to encounter the conditions that he faced after embarking on the mission of calling people to Islam. This was by itself a great revolution. The same relatives and friends, the same clansmen and neighbors, who used to treat him with the highest respect, began to shower him with abuse and criticism. No one in Makkah was prepared to listen to him; he began to be ridiculed and mocked in the street and on the road; and at every step he had to face new difficulties. Although gradually he became accustomed to the hardships, even much severer ones, yet the initial stage was very discouraging for him. That is why first Surah Ad-Duha was sent down to console him, and then this Surah. In this Surah, we see the feelings of sympathy and an atmosphere of delightful, friendly discourse abound. It in itself portrays the Divine care that the Prophet salAllahu ‘alayhi wa sallam enjoyed and explains the measures taken out of concern for him. The Surah gives the good news of forthcoming relief as we read in ayah 5, “For indeed, with hardship [will be] ease.” Meaning the period of hardship that you are passing through is not too long; following close behind it is also a period of ease. It then points out to the Prophet the secret of ease, “Stand up [for worship],” when you are free from your occupations. We see in the life of Rasoolullah that he used to devote himself to prayer. Another secret that the Surah emphasized on was building strong ties with Allah subhanahu wa ta`ala, “And to your Lord direct [your] longing,” meaning instead of worrying about what people are saying or doing turn all your attention to your Lord. From the opening sentence one learns that the Prophet salAllahu ‘alayhi wa sallam was troubled by something. It was the Divine message that he was entrusted with, and the obstacles that he was facing. These difficulties weight heavily on his heart hence the comforting address. The word “Sharh” as we read in Surah al-Anaam Ayah 125 means “to cut something, to open up, enlarge, expand or uncover.” This word also appears in Surah Ta-Ha Ayah 25, when Musa ‘alayhi salaam says, “My Lord, expand for me my chest.” In the context, it means opening up of the heart so that Divine wisdoms and mysteries could be comprehended and accepted. Comprehension and acceptance both are essential because sometimes we understand something but are unable to accept it. Allah subhanahu wa ta `ala says, “Did We not expand for you, your chest,” so that it may warm to the Message? Meaning have We not facilitated it for you, endeared it to you, defined its path and illuminated it for you to see its happy end? Look into your heart. Do you see it to be full of light, happiness and solace? Hence, in the later period we observed that the Prophet’s chest expanded such that he was confident, strong and his heart was at peace. He endured severe hardships and became a source of strength for others. We read that when the Prophet salAllahu ‘alayhi wa sallam was with Abu Bakr Siddeeq radhiAllahu ‘anhu in the cave of Thawr, Abu Bakr was under extreme distress while the Prophet assured him that Allah will take care of them. At another instance, when a man took the Prophet’s sword from the scabbard (during his sleep) and said, “Who will save you from me?” The Prophet calmly replied, “Allah”. 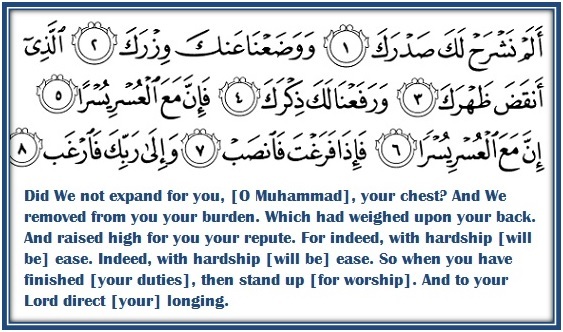 Then in ayaat 2 and 3 it was said, “And We removed from you your burden, which had weighed upon your back.” The word wiz’rak is from the root letters wau-zay-raand it means “to carry a burden, bear a load, or perpetrate (a crime).” This word has been interpreted here in two ways. Let’s first look at the word in the context of a heavy burden or responsibility. If we recall the incident of first revelation, we will remember that the Prophet salAllahu ‘alayhi wa sallam was almost shivering after having met an angel in the cave of Hira. He suffered from fever for several days because he was not prepared for this responsibility. He was under stress and anguish. Khadeeja radhiAllahu ‘anha comforted him that because he was such an honorable man, his Lord would not punish him. Then Allah subhanahu wa ta`ala relieved him of his sadness and gave him strength. Relief took the form of giving his heart a lift. Allah subhanahu wa ta`ala guided him regarding how to carry on this mission and appeal to people’s hearts. He now considered his mission easy and the burden that he felt was lifted. “And raised high for you your repute,” meaning Allah subhanahu wa ta`ala exalted him. At one time, he had only a few followers who secretly practiced Islam. After the conquest of Badr more people embraced Islam and Muslims became politically, economically and socially strong such that the Prophet’s enemies feared him. If we look at it today, our prayer is incomplete without sending blessings upon him. Secondly, the Shahada that people pronounce at the time of entering Islam includes testifying the Prophet Muhammad as the Last Messenger of Allah. The same Shahada is pronounced in the Adhaan as well as the prayer itself. Indeed, this is the highest degree of praise and status. It is a position granted only to Muhammad salAllahu ‘alayhi wa sallam. Generations after generations, millions of people honor his name by asking for peace and blessings for him. His followers have profound love for him. Moreover, Allah subhanahu wa ta`ala choosing him as His Messenger is in itself an honor for him. In Ayaat 5 and 6, Allah subhanahu wa ta`ala comforts and reassures the Prophet by saying, “…indeed, with hardship [will be] ease…” Hardship is never absolute, for ease always accompanies it. When the Prophet’s burden became too heavy, Allah subhanahu wa ta`ala lifted up his heart and relieved him. This is strongly emphasized by a literal repetition of the statement: “Indeed, with hardship [will be] ease.” For every challenge there is a way. A matter which afflicts Muhammad’s soul so much must be very serious indeed. The repetition also indicates while the challenge might be one there are several ways of addressing it. Secondly, the times of ease are more frequent than the times of difficulty. How often does one fall sick? How often does one lose all their money or face a loss? How often are we tested? Our problem is that when we are tested we only focus on all problem or the calamity and forget all the other blessings that we enjoy. Allah subhanahu wa ta`ala is acknowledging that yes at this moment there is difficulty. You have only handful followers but there will be ease. Grounds are being prepared for future success. The lesson for us is that when we are tested we should be patient and acknowledge that if Allah has put me in this there must be some khair and wisdom. Only then the person can survive his test. Then follows a statement pointing out the aspects of comfort and the factors contributing to the lifting up of hearts and spirits, Allah subhanahu wa ta`ala says, “So when you have finished [your duties], then stand up [for worship]. And to your Lord direct [your] longing,” meaning seek relief and solace in Him. The Prophet is being told that when you have finished whatever you may have to do, be it a matter relating to the delivery of your message or an affair of this life, then turn with all your heart to what deserves your toil and striving, namely devotion and dedication in worship. Seek Him alone and let nothing whatsoever distract you. Do not ever think of the people you call on to believe in Him. A traveler must have his food with him, and this is the real food for your journey. A fighter for a cause needs to have his equipment. And devotion to your Lord is the equipment necessary for you. This will provide you with ease in every difficulty you may encounter, and with comfort against every kind of affliction you may suffer. The lesson here for us is that never sit idle. Stay busy in something productive. Even when you are doing house chores keep your tongue busy with dhikr. Whenever you have a few extra minutes instead of flipping channels or browsing mindlessly, read something. Read some part of the Qur’an. Offer nawafil. Memorize a Surah. It is said that a believer passes away between two actions: one that he just finished doing and the one that he was about to do. In sha Allah, we will be updating the blog.